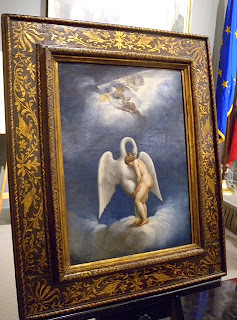 In an official ceremony held on April 26, 2012, at the Italian Embassy in Washington, DC, seven rare and priceless artifacts were repatriated to Italy, as part of an on-going international effort to track down, recover and return trafficked works and objects of art. “The story of each of these of artifacts tell us about the talent of great masters of painting, of sculpture and of the written word as well as tell of the time that each of the masters dedicated to beauty, to art, civilization and of course, the Lord.” said Italian Ambassador Claudio Bisogniero hosting the ceremony at the Italian Embassy in Washington, DC with U.S. Secretary of Homeland Security Janet Napolitano. The objects in pristine condition with a value well over a million and a half dollars were displayed on simple easels and pedestals. Two vessels, 2000 years old, were dug from the earth in Italy, smuggled into Switzerland and then transferred to Beverly Hills before being seized in New York at Christie’s Auction House. A small Roman marble statue, a janiform herm, also was smuggled from Italy into Switzerland before being auctioned at Christie’s Auction House. Three 13th century illuminated choir book leaves, ripped from two separate books, one at St. Paul’s Church in Pistoia and the other from the Monastery of Monte Oliveto Maggiore in Siena, were found on-line for sale by a rare book dealer in Portland, Oregon. The last object, unveiled with great flare, was the renaissance painting, “Leda e il Cigno” (Leda and the Swan) by Lelio Orsi, most rare for it is an oil painting on copper, had been illegally imported into the United States and was auctioned at Sotheby’s in New York. Morton made clear though that the Italians are monitoring the global art market and the evolving Italian organized crime networks. The office of the Italian Carabinieri for the Protection of Cultural Heritage General B. Pasquale Muggeo is arresting and prosecuting individuals. 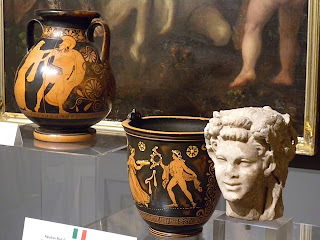 In fact, the discovery of these seven objects were the result of the Italian law enforcement community aggressively monitoring the internet and art sale catalogues for stolen Italian art. Tags: Christie's Auction House, Claudio Bisogniero, ICE, Italian Embassy, Janet Napolitano, John Morton, Leda and the Swan, Pasquale Muggeo, Sotheby's. Bookmark the permalink.